YO GABBA GABBA! LIVE! : IT'S TIME TO DANCE! tour is stopping in Philly on October 7th at the Tower Theater in Upper Darby. There will be 2 shows on Friday 10/7 first at 3pm and the second is at 6pm. Come see all your favorites like DJ Lance Rock, Brobee, Foofa, Muno, Plex and Toodee, with special guests Hip Hop Legend Biz Markie and Razzle Dazzle Superstar Leslie Hall. 'Yo Gabba Gabba! 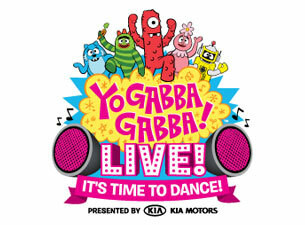 Live: It's Time to Dance' features a mix of favorite 'Yo Gabba Gabba!' songs, as well as new songs and performances. I am giving away a family 4 pack (four tickets) for the 3pm show on Friday October 7th to a lucky Fun Things reader. Just fill out the form below and leave you name and email address by Saturday October 1st, I will pick the winner on Sunday October 2nd. Congrats to Jasmine D! Have fun at the show.